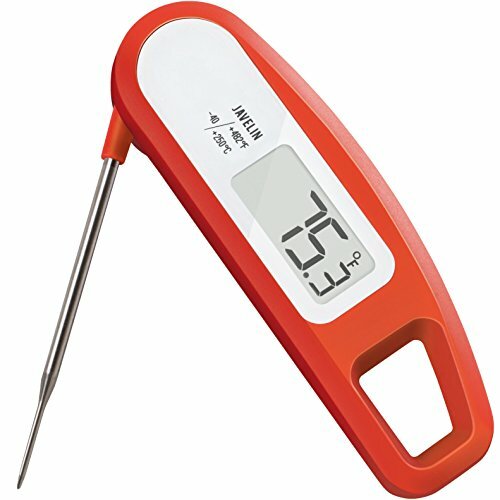 Why Buy A Digital Grill Thermometer? 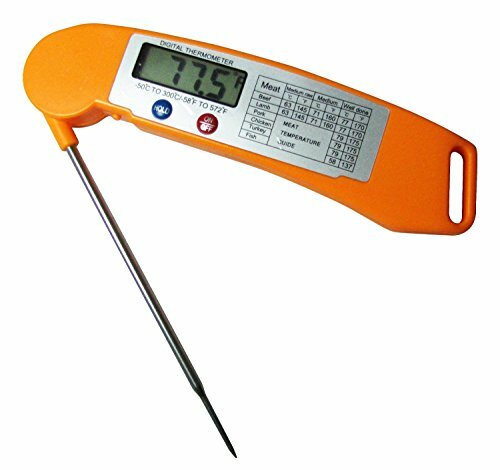 If you do a lot of barbecuing or grilling, a digital grill thermometer is a must-have part of your cooking kit, allowing you to quickly, easily, and accurately check the temperature of your meat, so that you can be sure your food is cooked just right. No more playing safe by cooking your barbecue meats in the oven and just finishing them off over the grill!. With a digital grill thermometer, you can do the whole cooking process over the grill without any risks or concern, and provide your friends and family with tasty, well-cooked food full of smokey flavor. With our handy reviews, you can easily track down the ideal addition to your cook-out kit. The Alpha Grillers Instant Read BBQ Meat Thermometer comes gift-boxed, making it ideal to give as a present, and can read in either Fahrenheit or Celsius, with an accurate temperature read out within seven seconds. It can be used indoors or out. The Alpha Grillers is best for occasional use – seasonal barbecues, for example – as it can be a little flimsy for more regular use, and also the probe isn't rigid, and does move about a fair bit when it's inserted into meat. The PT12, from LavaTools, offers a super-quick 4 second temperature read out on an easy-to-read, splash proof display, making it ideal when you're cooking large, juicy joints. It also comes in a range of cool, contemporary colors. It has an integrated magnet, meaning you can easily hang it on the side of your cooker or refrigerator, making it simple to store, and ensuring it's always right where you need it. Some people have commented that the PT12 seems to have some issues around steady battery contact, and, as the probe is a little on the short side, it's not great for thick steaks if you want to be certain that the temperature is spot on all the way through. With a free recipe book included, the Samsali Inspiration is definitely aiming to live up to its name, and providing you with the inspiration to add to your cook out capabilities! It offers a fast, five-second read out on an easy to read LCD display, and is built to FDA standards. As with the PT12, the Samsali does have quite a short probe, and, with the probe also being plastic, there can be issues around durability, particularly when it comes to high-heat grilling. It is probably best to purchase the Samsali if you're just looking for an accessory for the occasional summer barbecue. 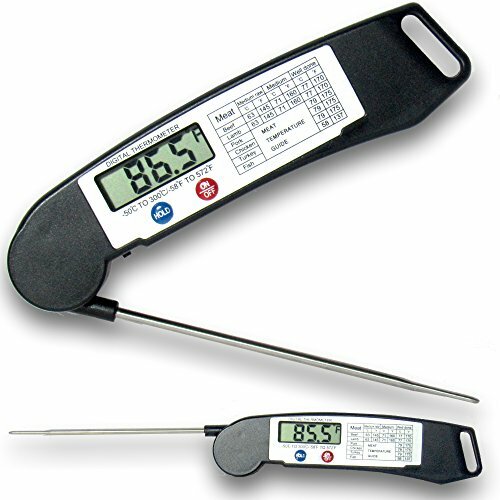 The Palermo addresses the issues of other digital grill thermometers by offering a fairly long, stainless steel probe, together with a temperature range that goes up to 57 degrees Fahrenheit/300 degrees Celsius, meaning it can handle even the most intense high-heat grilling with ease. The Palermo is easy to clean, and has an auto on/off function, saving your battery by shutting down whenever the probe is folded away. 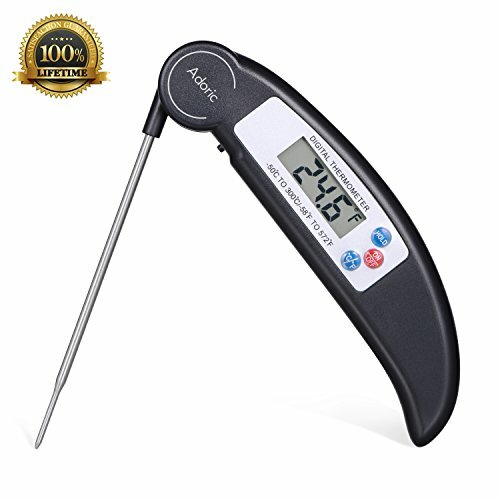 Finally, the Adoric Cooking Thermometer also offers a stainless steel probe, and a temperature range that goes up to 300 degrees Celsius/57 degrees Fahrenheit, and can easily switch between the two forms of measurement. It is splash proof, making it ideal for testing juicy steaks, or cooking during a drizzle. It can, however, be a little difficult to open. Investing in a digital grill thermometer means you can ensure your grilled and barbecued food is served at a safe temperature, meaning no one's fun is spoiled by food poisoning from under cooked food, whilst also avoiding the seemingly-inevitable burnt burgers and sausages. Digital grill thermometers are also good if you're regularly cooking steak – even when you like your steak rare, it can easily be ruined by being served lukewarm – you want it bloody, but hot. 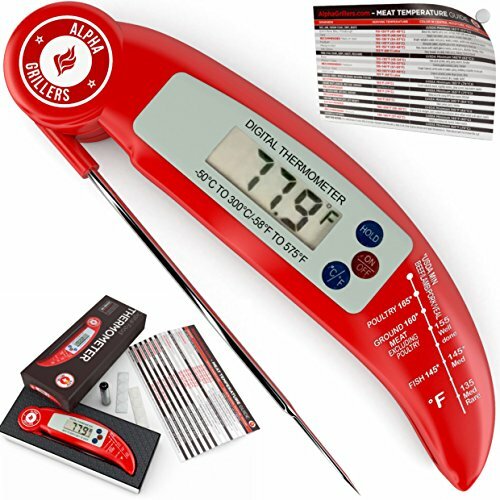 Digital grill thermometers are also easier to read than traditional thermometers when used to check that a stove top dish is cooked right through. While women do, of course, barbecue and grill, it is a well-loved stereotype that men can't do anything without the full collection of tools. (Or toys, as some people will refer to them, with a smile and a roll of the eyes.) A digital grill thermometer is the ideal “toy” for the man who likes cooking over flames, and, being small and relatively inexpensive, makes an ideal stocking filler or last minute gift. And, of course, there's the added bonus that a digital grill thermometer is the gift everyone can enjoy, courtesy of piping hot, tasty food straight from the grill – it really is the gift that keeps on giving! Why is grilling so popular? Perhaps because it, and barbecuing, are quite primal forms of cooking – it's meat and flame, conjuring ancient, genetic memory of how meal preparation ought to be. It's also a very straightforward kind of cooking, offering an accessible way for parents and older children to bond, and a fun way for those children to learn essential life skills. And, of course, a cook out is a great way to bring a family or neighborhood together – food is the eternal glue of relationships, and, when it is cooked and eaten outside, there is a lot more ease than when you're a guest in someone else's house, literally sitting at their table. With a digital grill thermometer, you can feel that primal thrill, and be the focus of group attention and admiration, whilst knowing that the food you serve is as good and as hot as it ought to be.